Big mountain, freeskiing, freemountain, you name it, these skis are made for getting deep— or at least skiing the deep. Wider boards with more float have made it easier to stay on top, democratizing the quintessential Western Canada ski experience. With the right technology underfoot, just about anyone can now ski this stuff. Look for some inspired designs this season, along with groovy geometry and profiling, as well as fantastic graphics on the industry’s biggest canvases. Long ahead of the curve in thinking light, randonnée and backcountry ruler Dynafit has created the amazingly low-weight and powerful Huascaran. At 136/115/125 and only 3.8kg per pair, it strikes a resonant chord for those carving their big snow signatures and results in more energy for extra laps. The Huascaran combines a progressive, B.C.-styled shovel with camber underfoot, semi-capped/sidewall construction over a bamboo/beach/paulownia core, integrated skin attachments and a powerful pin tail softened by a touch of rocker. While it works with any boot and binding combo you want, tourers and gram-conscience fanatics will get the most supersizing with Dynafit’s revolutionary TLT Radical FT Z12 bindings and ultralight and powerful Vulcan TF pro-model boot. Sift through Automatic’s DNA and you’ll see this powder-centric creation has Atomic’s big-hitting Bentchetler and Atlas wrapped deeply into its polymers. With TGR consultants Dana Flahr and Sage Cattabriga-Alosa on board, the ski sports a V-shaped sidecut, resulting in a surprising 19m-radius geometry despite its 132/117/117 sidecut at 186cm. Add-ons include a step-down sidewall, a powder-specific rockered tip and an uplifted tail with full camber underfoot, resulting in stability and surprisingly easy pivoting. Like the rest of Atomic’s Vantage lineup, Backbone technology, a lightweight centre-line titanal inlay, powers the ski and settles down any chatter you get in mixed conditions. 4FRNT re-engineered its classic Renegade ski technology for this year’s touring-oriented, big-mountain Hoji (130/112/121 at 187cm). Named after rider Eric Hjorleifson, expect a full reverse-camber semi-sidewall/cap hybrid ski with a design twist called Reflect-Tech: a jigsaw fit of matching rocker and sidecut profile. The ski arcs 30m-radius carves on firmer snow, but pivots easily and offers plenty of stability for whatever the mountain throws at you. An innovative rubber tail end supports skins and protects your investment from banging against gondola steel and parking lot cement. While Blizzard’s Gunsmoke (140/114/130) finds its place in the corral between Cochise (108 underfoot) and Bodacious (118), it’s a different beast altogether. Powered by the Austrian manufacturer’s renowned Flip Core 3D technology, it drops the double titanium layers of its bros, softens tips for play in the pow and uses underfoot camber (Bodacious and Cochise are fully rockered) for added pop and playfulness, especially on jumps. When big is better, the Bubba (130/145/127/134/124 at 178cm) may be best. Armada’s widest wood-core-with-sidewall, competition-ready ski replaces yesteryear’s Arg and boasts a powder-crocker profile, more effective edge and friendlier design, enabling effortless flotation, easy pivoting and improved planing. This is your go-to weapon when cats and helicopters purr outside. Line’s tip- and tail-rockered Influence 115 (145/115/131 for 22.6m turns at 186cm) went under the knife this summer. It emerges with 20 per cent more active edge for better grip, lower rising and lighter tips (to reduce bounce and plowing while improving planing), a new hybrid cap/sidewall construction and the addition of energetic, pre-stretched carbon fibre stringers along with Metal Matrix technology, an insert that reaches out edgewise to power the skis. Megawatt may be this year’s biggest loser—in weight that is. Now built with carbon, they hit the scales at only 4.25kg per pair (152/125/130 at 188cm). Black Diamond touts them as the ultimate touring-specific powder ski. Völkl tweaks its Kendo design this season, adding tip rocker in the shovel and a mm in the waist (now 126/89/110) to help it glide. Twin layers of titanal, combined within Völkl’s Power Construction and Multi Layer Woodcore, give it the power to ride just about anything. 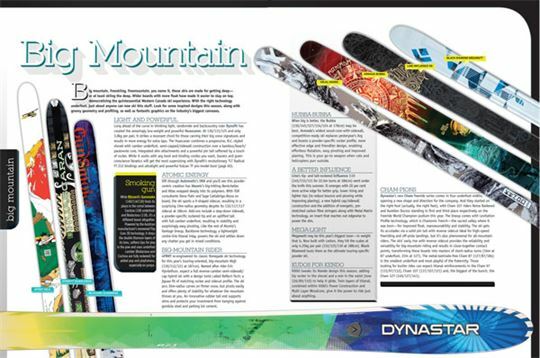 Dynastar’s new Cham freeride series comes in four underfoot widths, opening a new shape and direction for the company. And they started on the right foot (actually, the right feet), with Cham 107 riders Reine Barkered and Aurelien Ducroz standing in first and third place respectively on the Freeride World Champion podium this year. The lineup comes with Levitation Profile technology, which is Chamonix French—the sacred valley where it was born—for improved float, manoeuvrability and stability. The ski gets its accolades via a solid pin tail with reverse sidecut ideal for high-speed freeriding and off-piste landings, but it’s also phenomenal for all-mountain riders. The skis’ early rise with reverse sidecut provides the reliability and versatility for big-mountain riding and results in close-together contact points, transforming these boards into masters of short-radius turns (16m at 87 underfoot, 22m at 127). The metal-laminate-free Cham 87 (127/87/184) is the smallest underfoot and most playful of the fraternity. Those looking for burlier rides can expect titanal reinforcements in the Cham 97 (133/97/112), Cham 107 (137/107/121) and, the biggest of the bunch, the Cham 127 (149/127/141). Fischer has fattened up its tip- and tail-rockered freeski lineup with Big Stix 120, 110 and 98 (each denoting underfoot width), complete with long tip shovel geometry for improved float. Wood core sandwich construction results in smooth and balanced flex solidified with carbon technologies on deck. Freeriders looking for more of a hike-and-rider can check out Fischer’s Watea lineup. This year’s newest edition, the tip-rockered Watea 96, boasts the same sandwich construction as its Big Stix bros.
Take Armada’s JJ, add Tanner Hall’s signature and you get this. The brand-new Magic J (138/143/126/140/134 at 180cm) moves contact points forward and aft while widening things up underfoot. With less taper (read: longer turning radius), these rockered Big Mountain boards with camber underfoot offer stability at high speeds both in pow and on the firmer stuff. Claiming its most playful and progressive collection yet, Salomon builds on its freeride fame with five new men’s Rocker² (with 122, 115, 108, 92 and 90 underfoots) and three women’s Rockette models (with 115, 92 and 90 underfoots). All feature extra-wide reinforced edges that taper off before the extremities for catch-free skiing and landings. Models wider than 108 come with tip-lightening honeycomb inserts. Named and designed in conjunction with Canadian skiing phenomenon Sean Pettit, K2’s Pettitor is a burly, tip-and-tail-rockered, Big Mountain Factory Team powder board (147/119/141) with camber underfoot that’s right at home launching off natural features and on steep landings. K2, one of most important founding fathers of the Big Mountain genre, builds the Pettitor with a fir/aspen core stiffer than any other for stability, contact points closer together for glade play and reduced swing weight for big-air antics à la Pettit. The Spoon is huge (150mm underfoot) and completely unconventional (we’re talking complex shape, rocker, base convexity and a six-pack of edge-like cleats working together on a banana-ed ski) with a singular motive: powder. DPS’s radical design, now years in the making, will deliver massive flotation, says its maker, nimble handling and create huge sprays, though you might just need a dedicated cat or heli and a stash of limitless, bottomless powder to test it thoroughly. After more than a decade of conquering big Alaskan lines, Seth Morrison has moved on to whiter pastures, now alpine touring the most technical terrain in the French Alps. Appropriately, the Side Seth (147/118/135) comes in as the newest entry into K2’s well-loved BackSide adventure series. The hard-charging ski comes with a stiff tail, but softens up with a touch of rocker for versatility and forgiveness in the couloirs, and is built on a laminated fir/aspen/maple core. Like the rest of the BackSide series, long popular with the ski patrol crowd, it comes with pre-drilled (and capped) holes in the tip and tail for donning K2-specific pre-cut skins, and also for building rescue sleds and snow anchors. Big, fat and sturdy are just three of the adjectives used to describe Prior’s biggest board yet. At 145/124/130 at 188cm, the fully rockered A-Star will float your boat just about anywhere you sail. Like the rest of the Overlord series, you can upgrade to XTC Carbon for 600g in weight savings. Born and bred on Vancouver’s North Shore, G3’s Empire (153/127/139) comes with a progressive camberline and rockered tip and tail for max float and easy turning whether you’re driving pow or crud. These camber transitions also provide solid hold on hardpack when edged. Lightweight and powerful, it gets force and dampening via a titanal topsheet. Semi-cap construction provides edging power while keeping it light— 1.8kg/ski. Black Crows releases Sevun II (146/117/136), an upgraded version of its classic Big Mountain ski. 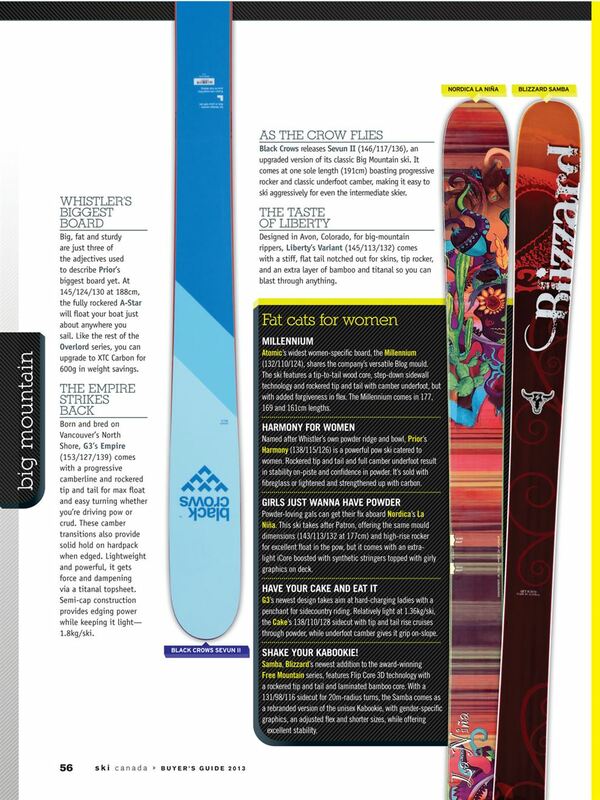 It comes at one sole length (191cm) boasting progressive rocker and classic underfoot camber, making it easy to ski aggressively for even the intermediate skier. Designed in Avon, Colorado, for big-mountain rippers, Liberty’s Variant (145/113/132) comes with a stiff, flat tail notched out for skins, tip rocker, and an extra layer of bamboo and titanal so you can blast through anything. Atomic’s widest women-specific board, the Millennium (132/110/124), shares the company’s versatile Blog mould. The ski features a tip-to-tail wood core, step-down sidewall technology and rockered tip and tail with camber underfoot, but with added forgiveness in flex. The Millennium comes in 177, 169 and 161cm lengths. Named after Whistler’s own powder ridge and bowl, Prior’s Harmony (138/115/126) is a powerful pow ski catered to women. Rockered tip and tail and full camber underfoot result in stability on-piste and confi dence in powder. It’s sold with fi breglass or lightened and strengthened up with carbon. Powder-loving gals can get their fix aboard Nordica’s La Niña. 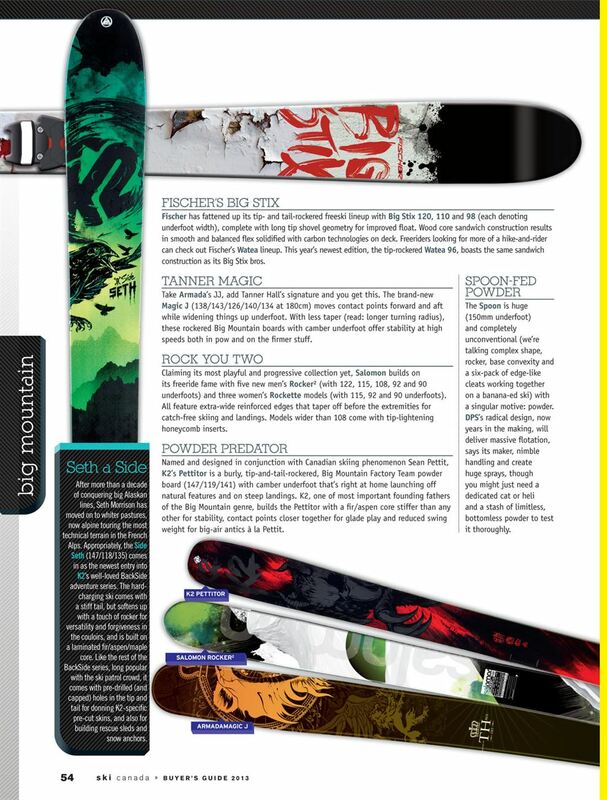 This ski takes after Patron, offering the same mould dimensions (143/113/132 at 177cm) and high-rise rocker for excellent float in the pow, but it comes with an extra-light iCore boosted with synthetic stringers topped with girly graphics on deck. G3’s newest design takes aim at hard-charging ladies with a penchant for sidecountry riding. Relatively light at 1.36kg/ski, the Cake’s 138/110/128 sidecut with tip and tail rise cruises through powder, while underfoot camber gives it grip on-slope. Samba, Blizzard’s newest addition to the award-winning Free Mountain series, features Flip Core 3D technology with a rockered tip and tail and laminated bamboo core. With a 131/98/116 sidecut for 20m-radius turns, the Samba comes as a rebranded version of the unisex Kabookie, with gender-specific graphics, an adjusted flex and shorter sizes, while offering excellent stability.